Phoenix (January 26, 2014) – When Faith Bible Church, a Bible-centered church in The Woodlands, Texas, built a new 900-seat sanctuary, Houston-area AV contractor Hairel Enterprises selected a Vista Systems Spyder X20 0808 as a key component of the new video projection system. Faith Bible marks the first use of a Vista Spyder by Hairel, which provided full AV and theatrical lighting for the sanctuary. “I knew about Spyder and got in touch with Vista because I thought it would be a perfect fit for this installation,” says systems designer Bruce Simmons. “My cold call to Vista turned into a four-hour conversation. They arranged for a demo, and the church was elated by what they saw.” The video projection system will be operational in late January 2015. The new sanctuary has a raised platform area at its center. A motorized 25×9-foot screen drops down from the ceiling for use in worship services and special events and productions. Two additional 16×9-foot screens flank the center screen and are permanently affixed to the walls. A two-projector center edge blend and the two outer single-projector images are accomplished with four Barco RLMW8 projectors and a Spyder X20 with 8 inputs and 8 outputs. Two Macintosh computers loaded with Pro Presenter are also sources: one for song lyrics and Bible verses, which are keyed onto the backgrounds, and one for moving video playback. Live cameras for IMAG also feed the system. Faith Bible expects to add environmental projection capabilities, too, enabling the walls and sanctuary architecture to become canvases for still images and video. Russell Hartsfield handled client relations for Hairel Enterprises for the project. 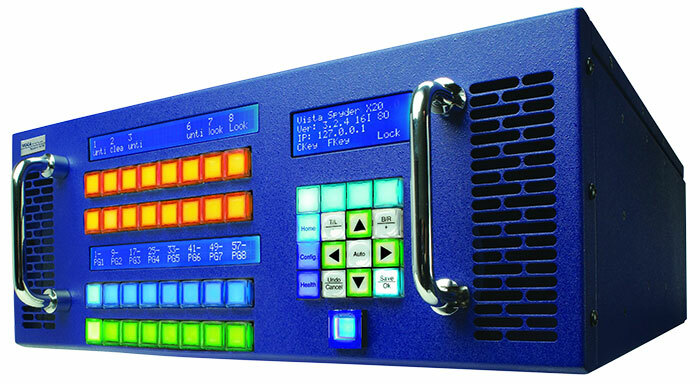 Vista Systems’ switchers have become the industry standard for live multiple-destination video and data mixed signal switching with real-time windowing and composition. For more information on Vista Systems, visit their website at www.vistasystems.net.